Should I go to failure to get stronger? At our last powerlifting team training session, I had the athletes doing sets of 4-6 reps on the bench press at 85% of max. 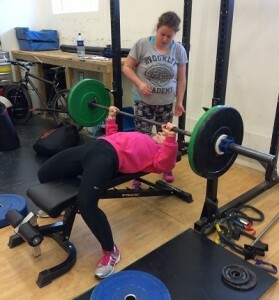 One of my athletes did her first set, ably spotted by her training buddy. Rep 5 was a bit of a grinder but she managed it. I was all ready to shout in support for her 6th rep effort, when she racked the bar! Rep 5 felt really hard to her, so she decided to call it a day right there. But I thought there was the possibility that she had another rep in her. A slim possibility, sure, but still, I didn’t think she was done. I asked her why she stopped there. She laughed and said she didn’t really know, she just thought ‘that’s enough’. This is an interesting situation, both from the athlete and the coach perspective. Would she have got stronger from trying (and failing) a sixth rep? The research says, no. There have been many studies and meta-analyses done showing that training to failure and not training to failure (stopping one or two reps short) result in more or less the same strength increases. But are there other reasons for sometimes pushing your athletes, or yourself, a bit harder? As a coach, I believe yes. First of all, let’s set the context. The athlete I mentioned above is a competitive powerlifter, training for powerlifting competitions. In powerlifting competitions, you only have one rep and you have to make it count. Going for a personal best, you may well have to grind it out. The rep can take much longer than usual; the bar often comes to a complete stop at the sticking point and you have to push really hard to get past it, applying force from whatever part of your body you can. I know from working with many lifters over the years that for most people, this is something they learn how to do. Most beginners just don’t know how to bring that kind of effort to bear for that length of time. You are in full ‘fight or flight’ mode, and some people don’t fight hard in that situation. So it is something you get better at with practise. And it is more of a psychological/instinctual kind of training than just neuro-muscular training. A powerlifter needs to know how to do this. How about a non-powerlifter, someone who is just in the gym to increase strength and fitness? No, they don’t have to fight to the death with the barbell. They can leave a rep or two in the tank and – so the research says – still get strong. Now here’s the rub: how do you know that you only have a rep or two left in the tank? Many people just stop when it starts getting hard. They think they only have a rep or two left in the tank, whereas they may well have 4, 5, 6 reps left in the tank if they really had to fight for them. This knowledge comes with experience. You need to have experiences of being pushed and trying really hard, to know whether you are trying really hard. Many of the people who come to me for training know deep down that they don’t push themselves when training on their own. That’s why they are seeking help. Your results and your progress – or lack of it – can also be a clue! But you need to have very good technique to push yourself hard, in order to maintain your form while getting more and more fatigued. When it comes down to it, most people are afraid to push themselves because they don’t want to get hurt. And that is sensible! You should not be getting hurt lifting heavy. Tired, yes. Hurt, no. My opinion is that you should be confident in your technique first, before attempting reps to failure, especially on the big compound lifts like squat, bench press and deadlift. In fact, some people refer to ‘technical failure’, meaning the point at which your technique breaks down, not the point at which you can no longer lift the weight at all costs (including your spinal health!). This is, incidentally, why much-maligned machines in the gym are very useful for bodybuilders; it enables them to absolutely smash a particular body part while supporting the rest of the body relatively safely. If someone wants to smash their quads into quivering wrecks, most people are safer doing this on a leg press or a leg extension rather than under a barbell. But I train people for strength, and for powerlifting and weightlifting, so I am talking about free weights. And that’s why, when I say ‘go to failure’ I do mean ‘technical failure’ by default. This isn’t just about being mobile enough to get into, say, the start position of the deadlift. It is also about being strong enough to maintain the correct back position throughout the duration of the pull. For a beginner, it might feel like you have the strength in your legs to pull a heavier weight or do more reps, but unfortunately you are not yet able to hold your lower back and shoulder blades in the safest position. If you can pull the bar off the floor, but your lower back is rounding significantly when you do so, this would be an example of ‘technical failure’. Once your technique is competent (and for most people, this shouldn’t take more than a few weeks to a few months if you are being taught well), then it is a useful exercise to occasionally test your limits. A good way to do this is to choose a submaximal percentage, like 85% or 90%, and do as many reps as you can at that percentage. Go beyond what you think you can do. Don’t even have a number in your head (“I’ll see if I can do 5”), just keep going. You might surprise yourself. But more than that, you’ll feel what it is like to really go hard. Going to failure should be safe. There’s no reason why it should hurt you at all, apart from in the sense of giving a big effort. Use this checklist to make sure your environment is safe for lifting heavy. Make sure the area around you is clear of plates or other detritus so that if you drop the bar, it doesn’t land on anything that could make it rebound on you. This includes your squat stands or cage. Make sure you are in a position where another person can’t suddenly walk in your way. If you are benching in a gym, ask for a spotter. If you don’t trust the other punters, ask a member of staff. If you don’t trust the staff, find another gym. You can also use tactics to maximise your chance of performing well and being able to push yourself. Practise good form in your warm ups and think about it, so that your body is in the habit. Get someone to watch you and monitor your form, especially if you are worried that your technique will disintegrate. Film yourself (if you have no-one to watch you) – it often feels worse than it actually was. This can give you confidence for your next attempt, or make you realise that you had more in the tank. Have a spotter – even if you have the safety bars up, having an actual person spotting you as well can be a big confidence booster. Wear a belt (if you know how to use one) to give you that bit of extra support as you fatigue. Maximise your grip for deadlift by using chalk, mixed grip or hook grip (click here for advice on grip). Create an atmosphere, train with a friend who will push you, put your favourite tunes on. Get a good night’s sleep; have a good breakfast. And finally, if you want to make progress but you are not willing to ask people for a spot, I don’t know what to say! What happens when you go to failure? So what happened to my lifter who stopped at 5 reps? She failed her 6th rep. But only just! She told me afterwards that the tank just ran out at that point. It was a looong rep, a lot of pushing, and she couldn’t quite finish it off. But she was very happy to have tried, and surprised at just how far she got. Want some help in person? I sssoo enjoyed reading your article and also following you now. Thanks Lisa! Having a training buddy is a really good way of pushing yourself. 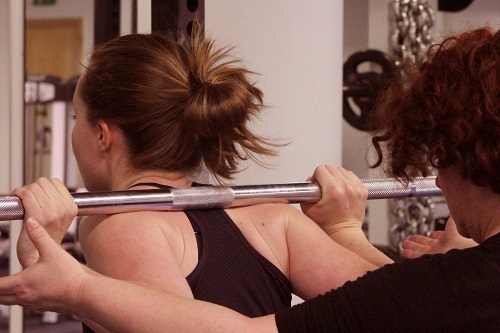 I can see in my Ladies Who Lift class that the girls do more if the people they are training with are pushing it too.